The last week has been a little crazy with all the blog traffic from The Secret Treasure Room post going viral. I'm amazed at how many people have seen my project and that it's been translated into at least four other languages. Welcome to all my new blog followers! It's been a pretty productive sewing week. Unfortunately, I can't show you what I've made the most progress on since it's a challenge quilt I'll be submitting by the end of the month. I did make some other progress that I can show you. This philanthropy quilt for my guild (pieced by another member) has been prepped and pinned to quilt. If I can get the quilting and binding done by this weekend I can drop it off during Monday night's meeting. I also started real work on my A Lovely Year of Finishes August goal. I've attached the two appliqued pieces to my mug rug and it's ready to quilt. This was my first attempt at turned edge machine applique and I'm pretty happy with the process and the result. Not sure if I'll knock out a few more mug rugs for practice or jump into using this new technique on The Girl's cuddle quilt that's waiting for some sea life. I'm linking up to Linky Tuesday, Fabric Tuesday, Let's Bee Social and WIP Wednesday. Posted in Quilting. 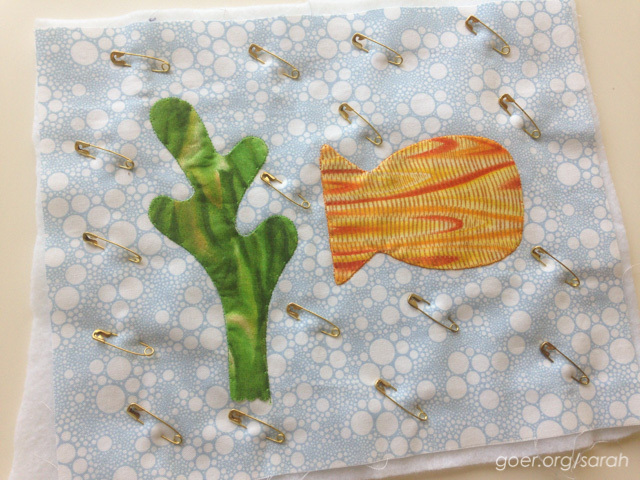 Tags: fish, mug rug on August 20, 2014 by sarah. Your applique looks really good! Its going to be cute mug rug. Congratulations on all the new traffic, Sarah! It's always nice to make some new quilty friends. Looks like you are going to be busy quilting now. Both your projects look pretty. Can't wait to see that mug rug come to life! Isn't it fun to make donation quilts in community? 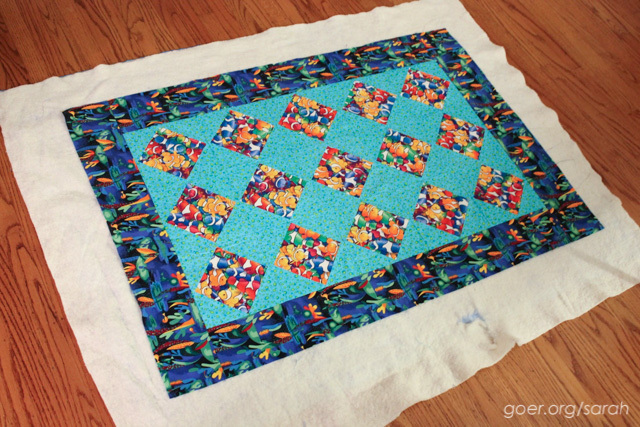 I usually piece tops and am always amazed how much work the quilters put into them. This looks lovely, too. I do enjoy the collaborative process and think it's a great way to contribute without needing to do the whole quilt solo. :-) Thanks for visiting! Your mug rug looks cute. I have never tried turned edge machine applique. I love machine applique but have always done a raw edge. This looks interesting. Hope you'll show your mug rug again as it progresses.